Going small : sailing large. – Dirty wet dog , boats and sailing. Going small : sailing large. Note to regular readers : this is the 3rd and final section of the original ‘how small’ series. This is essentially a re-write of the Charles Stock/Shoal Waters section, in short a look at how small it is feasible to go and still have a viable cruising boat. Please note that throughout this post i talk about the late Charles Stock very much in the present tense, i know that i should say ‘the late’ but it doesn’t read well and in a way his work lives on with his book and his boat : now under the care of ‘Creeksailor’ Tony Smith. It is extraordinary to realise that the little green gaffer ‘Shoal Waters’ is now 55 years old this year : that’s only 5 years younger than me. I had to dig my copy of Charles Stock’s book ‘Sailing just for fun’ out to check but its true that he took delivery of the unfinished hull of his boat to be not long before my 5th birthday…..i can’t say i remember what i got as a birthday present but it certainly wasn’t a hot-molded 16 foot dinghy hull ! The original boat was designed by Charles Currey and intended as a sailing dinghy, the construction was unusual in that it was hot-molded from 4 layers of Agba veneer much like the Fairey Atalanta which i have mentioned here before. Just as a side note i was watching out for a Fairey Duckling dinghy after having used Pete Thomas’s one in Ipswich during the Inanda project. In 1963 Charles Stock then built Shoal Waters from the bare hull + transom and centreboard basically by eye, with hand tools and with very simple materials only , mainly plywood (2 sheets) and a hundred feet of 1″ square mahogany. There were a few exotic bits involved including the top of a grand piano, part of a billiard table and part of a counter top from a branch of Lloyds bank. The rig came straight from his previous half-decker ‘Zephyr’ although it did get some new sails when a tiny bit of budget allowed. Characteristically the boat didn’t get an engine and , don’t think, has ever even been set up for an outboard. He did however carry paddles and a quant pole. According to him, between launching the boat in 1963 and the writing of his book in 1997 they had sailed some 68,000 miles in mainly weekend passages around the east coast rivers bordering the Thames estuary…extraordinary also that one of his regular achievements was the ‘hundred mile’ weekend : i can’t even remember the last time i sailed a hundred miles in a weekend except for when i sailed fully crewed race boats in the Irish Sea. To put this boat in size perspective it’s a couple of inches longer than a Wayfarer dinghy, has about the same beam but is slightly ‘boxier’ in it’s depth of hull. As can be seen she has a neat cabin roof and inside that a galley and 2 usable bunk spaces. I happen to think that Shoal Waters and other large sailing Dinghy’s represent the smallest viable cruising boats before the transition into ‘Dinghy cruising’, between Shoal Waters, boats such as the Cornish Shrimper and on up to about 21 feet represent for me the world of the micro-cruiser. Many of those boats would be viable for the kind of sailing i have on my very different coast and where something like Shoal Waters might not do quite as well. I also find that i benefit from having an outboard engine to get me home and that some , but not all, modern clothing and equipment …..good foul weather gear and GPS come to mind….all serve me well for what they cost. 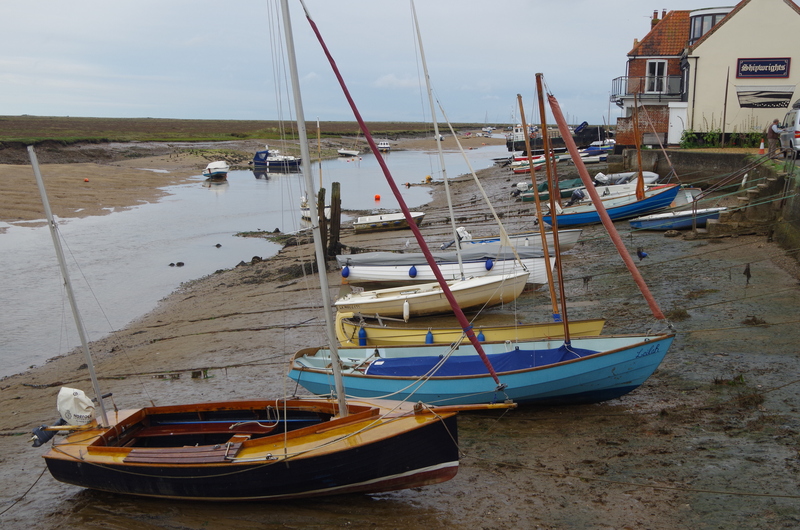 In his book ‘Sailing just for fun’ he does say though that the choice of boat was largely shaped by his cruising ground and that was always going to be mainly the Kent, Essex and Suffolk coasts and their extensive river systems including the huge Thames estuary. This would mean a lot of shallow water rivers and creeks although mainly sheltered waters rather than the steep-to bold coast and bigger seas of the channel and the west-country. I hadn’t really understood the significance of this until i sailed an east coast designed boat in it’s home waters where it did well and then took it into the bigger seas off the Devon and Cornwall coasts and where it really struggled. In his book Charles Stock lays out the case for the small sailing boat and for simplicity of its gear, once again this may in part due to the stark necessity driven by a minimal budget but then he also argues the case that his solution : Shoal Waters fits the requirement of his cruising ground. That it worked for him and over a long time is without doubt and that he continued to find interest in his chosen cruising ground year on year shines through his writing. I haven’t said much about his book except that it is THE classic book about micro-cruising around the Thames and that’s because i want to pick that up again in my ‘good reads’ series. Charles Stock passed over the bar at age 85 in 2012, his boat lives on and sails on in the care of it’s new keeper : Tony Smith ‘Creeksailor’ who has picked up the genre with his own voyages in the little green gaffer and his own website/blog and video clips. Nice short read and a tribute to both Mr. Stock and small sailboats in general. I’ve a much modified Lehman 12′ I sail here on the Texas coast. You’re welcome and nice to hear from you. The photo of Charles Stock’s Shoal Waters is mine, but I’m happy for you to use it, and by the way, thank you for your brilliant blog. At 84 years of age my sailing days are almost over. I’ve been blessed with many great adventures afloat, and a good many of them have been recorded at my blog. By the way, did you know Geoff Lennard who lived at Calstock and kept several boats there? My old Pioneer 9 ‘Aziz’ was there on the hard a few years ago. I may have mentioned this to you before. I wonder if she is still there? There’s mention of her at my blog. It would be nice to credit you with the photograph….how would you like that done ? I saw Aziz in the yard , sadly she is in a terrible state and Chris has had to move her well into the yard as she is a total eyesore ! Enjoyed that again Steve, thanks. Out of interest, the £200 it cost Charles Stock to build Shoal Waters is equivalent to about £4000 now according to the Office of National Statistics. I suspect that in real terms today that it would be more than £4000 although it’s difficult to tell because most of the initial cost was in the pre-made hull and i don’t know of anything similar available today. Of interest that was about the same amount i had budgeted for my Dayboat project at almost exactly the same size. Yes, I suspect you’re right. As for your Dayboat cost, plus ça change, plus c’est la même chose and all that. Some time i would like to continue the small boat series with a post about you and Arwen. Ok, not sure I’m blog material but prepared to give it a go. Let me know when you want to chat about it and we can decide whether Im worthy of a small boat blog post. No, it;s all good. Doing a cover on you and Arwen would be a logical development in the small cruising boat series….i have never really covered dinghy cruising although i have mentioned ‘Shoal Waters’ a few times. it would be a very nice one for the blog if you’re up for it. I’m at the fringes of dinghy cruising there are many more far far ore experienced than me but yup if I can help let me know. Limited experience but have some perspectives. Depends what angle you want to take etc.